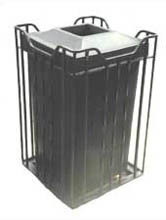 Iron Sides Collection - Best Litter Receptacles Inc. 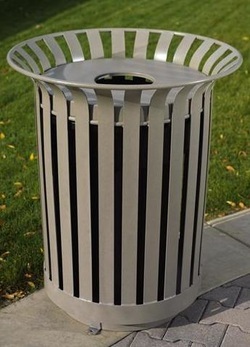 This metal receptacle is made of heavy steel with long-lasting thermoplastic coated finish in many standard colors, constructed with a decorative, wrought iron or flat fence appearance. 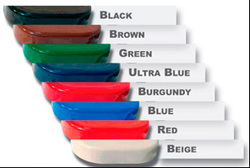 The 40 gallon liner made of the rotary molded polyethylene and there is a choice of a variety of colors; black, brown, green, blue, dark or light gray, beige, red. 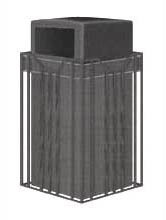 Lids are polyethylene or steel to match base of units. Anchor bolts are available for extra security. Your custom logos or labels are available. Smooth, Hammered or Southwest vertical slats. 36 Gal with liner and lid. Powder coating is an advanced method of applying a decorative and protective finish to a wide range of materials and products that are utilized by both industry and consumers. The powder used for the process is a mixture of finely ground particles of pigment and resin, which is sprayed onto the surface to be coated. The charged powder particles adhere to the electrically grounded surfaces until heated and fused into the smooth coating in a cuing oven. 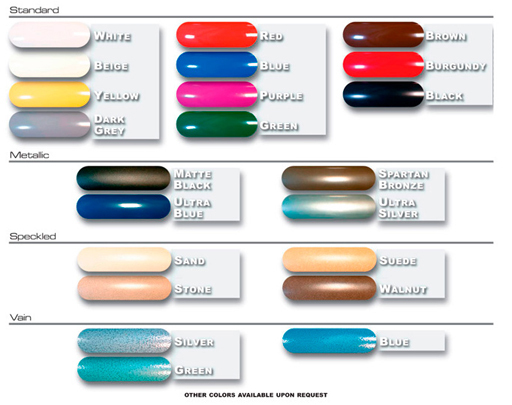 The result is a uniform, durable, high-quality, and attractive finish. Thermoplastic is designed to meet a wide range of performance qualities, which include excellent mechanical performance, impact resistance, superior ultra high adhesion, and ultra violet protection. The abrasion and impact resistance of the UltraCoat thermoplastic process is unsurpassed with over 2000 hours of salt spray testing. The copolymer polyethylene chemistry formula provides strong adhesion and performance properties. 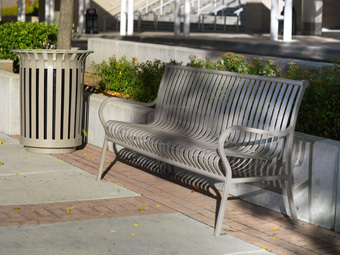 UltraCoat can be spray coated on most of our table and bench frames at 8-12 mils thick. Standard dipped product is at 40-50 mils thick. with matching colors and styles.